A 56-year-old man is dead following a serious car accident; the tortfeasor (at-fault driver) now faces DUI manslaughter charges. According to the Florida Highway Patrol, the wreck occurred on Ulmerton Road near the Wild Acres Road intersection. A 34-year-old man, who was travelling at a high rate of speed, tried to pass a Kia Forte. But the man misjudged the maneuver and rear-ended the Kia. The force of the collision pushed the Kia off the road and into a light pole. The driver, whose name was not released, died almost instantly. The 34-year-old man, who suffered serious injuries, was booked into the Pinellas County Jail after he received treatment at a local hospital. If the Florida tortfeasor violated a non-penal statute, like a traffic law or an OSHA rule, the negligence per se shortcut still applies. However, there is only a very strong presumption of negligence instead of an automatic declaration. Even if the tortfeasor was not found guilty of DUI or has not stood trial before a judge hears the civil claim, the shortcut still applies. In civil court, the jury decides all factual matters in the case, including any related criminal infractions. 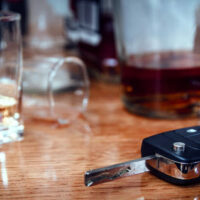 Even if the tortfeasor is not charged with DUI, the victim/plaintiff can often still establish alcohol-related liability. First, impairment begins with the first drink and it often takes two or three or more drinks for a person to reach legal intoxication. Second, the burden of proof is much lower in civil court than it is in criminal court. Under 21: The old “s/he looked older” excuse is usually not a legal defense in these cases. Commercial alcohol providers that sell alcohol to minors are usually strictly liable in these cases. Habitual Addiction: Commercial providers are also liable if they sell alcohol to individuals who are habitually addicted to alcohol. Victim/plaintiffs can establish this point with circumstantial evidence. Packaged alcohol providers, such as grocery stores and convenience stores, may also be liable under the dram shop law. That’s because it is foreseeable that a person will open a can of beer on the way home and have a few sips. Impaired drivers cause about a third of the fatal collisions in Tampa. For a free consultation with an experienced personal injury attorney in Tampa, contact The Matassini Law Firm, P.A. Our main office is conveniently located in West Tampa.